Community Blog by GundamJehutyKai // Say hello to my little friend!! I will be the first to admit that I have a little vanity in me. Not the usual physical type where I love looking at myself in the mirror (hell, I wouldn't even count myself as even remotely handsome) but more to do with what I collect. Being a big fan of Japanese anime figures, I've collected a number of figures and model kits over the years but unlike many others, I don't simply buy completed figures from online shops to display. That kind of thing has never appealed to me. Afterall, what's the fun in collecting and showing off things if your items are exactly the same as everyone else who bought the same item? 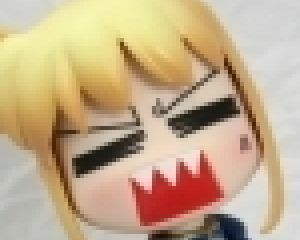 As a result, my usual poison is making garage kits, Super limited items which require me to assemble and paint them myself. The end result being a completed figure which is uniquely mine. See where the vanity comes in? This also stretches over to video games as I have a tendency to lean towards limited edition versions of video games (or at least steel case versions) when they are available. But the nature of video game buying means that you can't really stamp your purchases as your own. Other people will buy limited edition games as well afterall, Sometimes, you can make them stand out by getting them signed by the developers. I Managed to get Kitamura to sign my Final Fantasy XIII (the only reason I haven't banished the game from my home), Hideo Kojima for metal gear solid 3 and 4 among a few other trinkets but otherwise, my collection is pretty non descript. 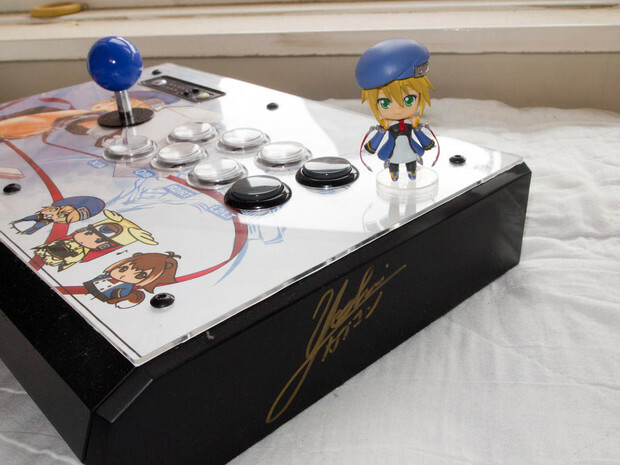 But for a while now, I've been getting into fighting games and, as many similar gamers will tell you, it's all about using an arcade stick! 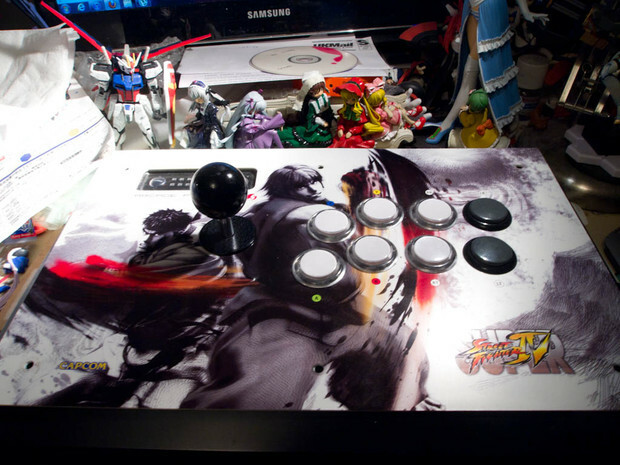 So about a year ago, I purchased a Mad Catz Super StreetFighter IV TE:S fight stick. And one of the first things I did was to contact someone on a local forum to get it modded to run on both PS3 and 360. But it didn't stop there. 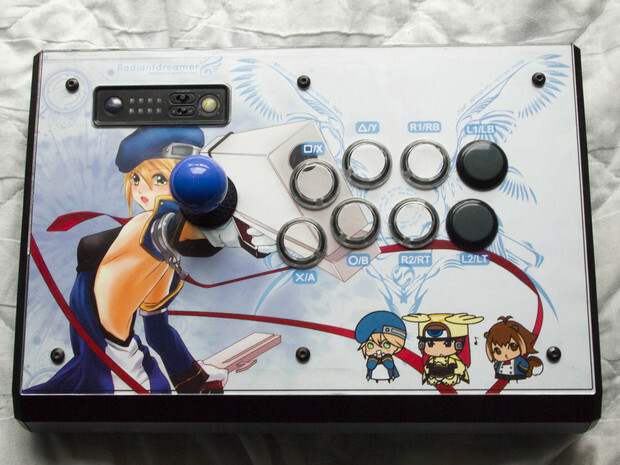 After a little bit of thought, I figured that I would mod my arcade stick as it's one of the few things which I could stamp as being uniquely mine. 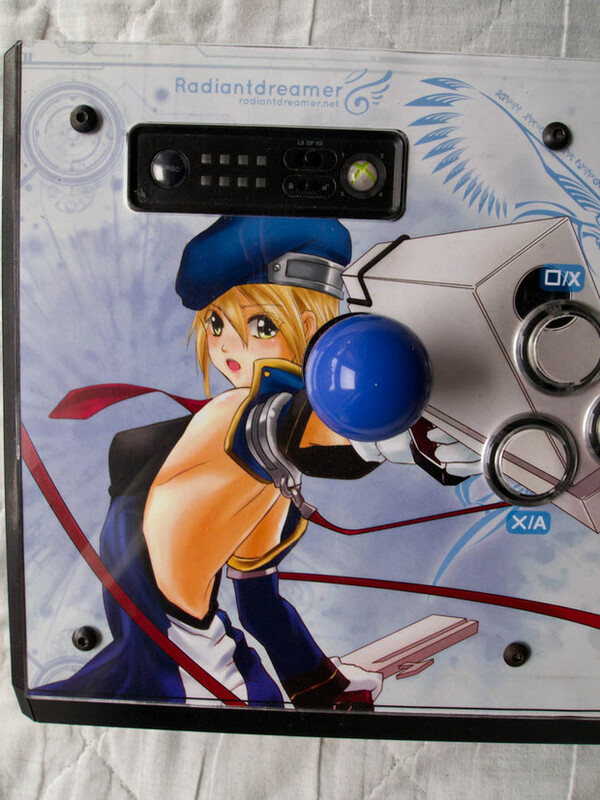 And because I'm a big fan of Blazblue, I decided to wear my allegiance on my sleeve, or rather, my stick!! 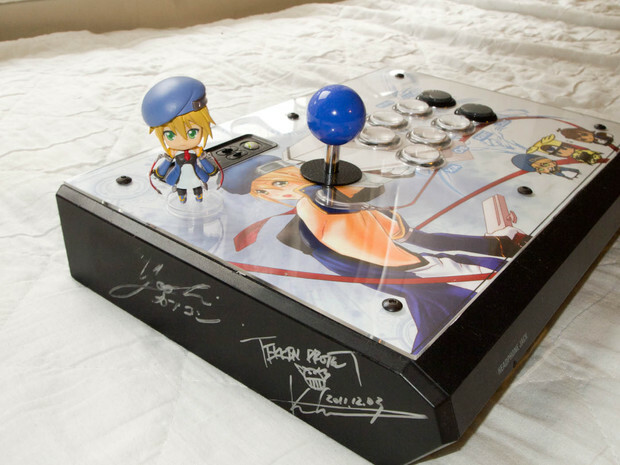 The second reason was because Seimetsu do clear buttons which let you do some cool things with the artwork! Take a closer look again! 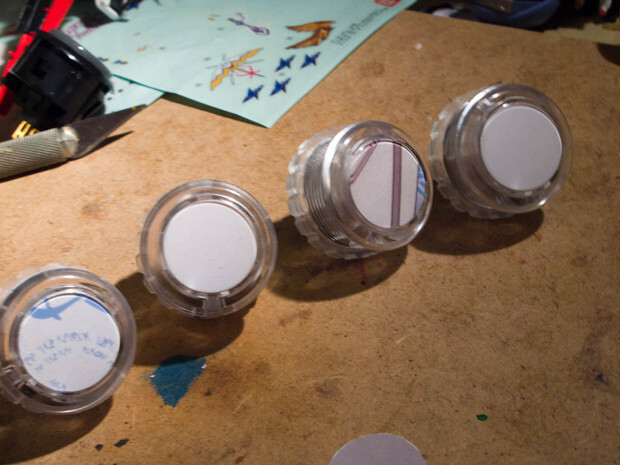 The clear buttons allowed me to put some of the artwork into the buttons to give it a look of being unbroken. The right side was what took up the most time to decide on as I wasn't happy with the idea of leaving it too plain but couldn't decide on how I was going to full up the empty space. Radiant helped me out here and we went for Noels Emblem. 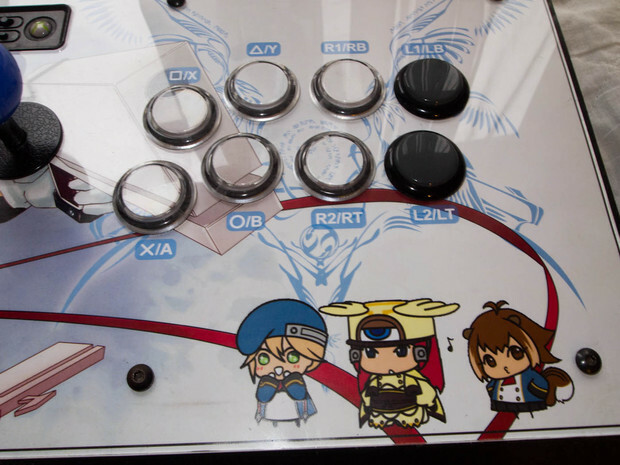 The Chibi characters are the ones used in the "teach my Ms Litchi" segments from the game as well as the Bururaji radio show from the game. If you haven't listened to them, find them on youtube. Some are absolutely hilarious! Sadly, there weren't any sprites for Makoto in her combat outfit at the time so I had to make do with the uniform. I was given the pst file from radiant so I should be able to update it later will little fuss. There was a little worry that they would provide too big a distraction on the artwork as a whole but I stuck with it and I think it turned out pretty well! Well, that's enough about me showing off. Time to put the stick through its paces. And just in time for soul calibur V! And for those curious, I wrote a personal blog post which went into a little more detail about the assembly process.